Hunter Bell, Susan Blackwell and Jeff Bowen talk creativity, collaboration and dinosaurs. NOW. HERE. THIS. 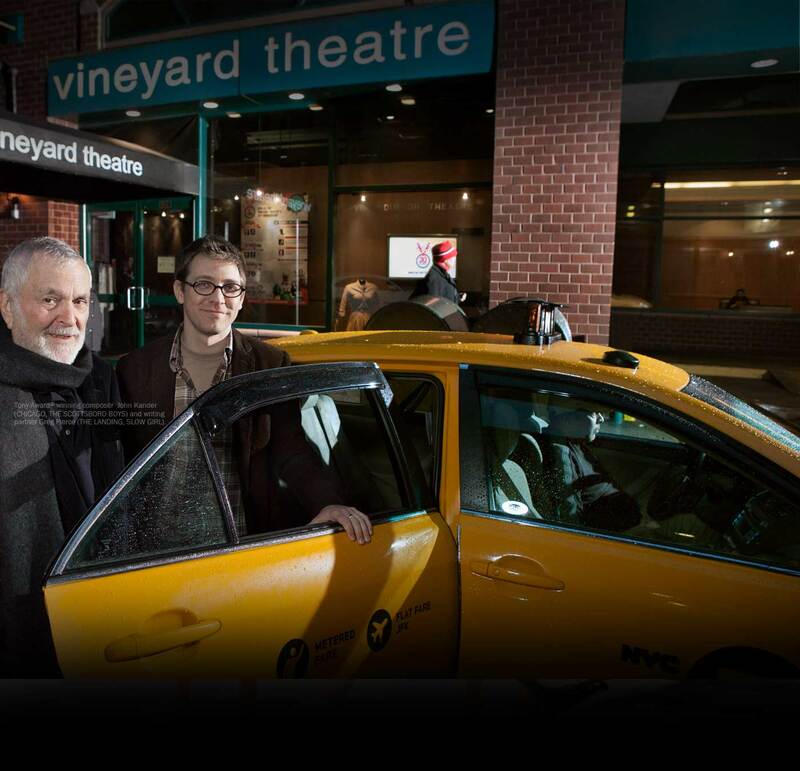 marks the return to The Vineyard of the ultra-talented team behind the Obie Award-winning [title of show], which premiered at The Vineyard in 2006, and went on to an acclaimed Broadway run in 2008. With NOW. HERE. THIS., the six original collaborators — Hunter Bell, Jeff Bowen, Susan Blackwell, Heidi Blickenstaff, Michael Berresse, and Larry Pressgrove — are back, some wearing new creative hats, and all delving in to life’s big questions with inimitable humor and perspectives. Co-Artistic Director Sarah Stern spoke with Susan and Hunter (co-book writers), and Jeff Bowen (music) about the evolution of the show and of the creative collaboration behind it. How would you describe NOW. HERE. THIS.? Can you talk a bit about how its form and themes evolved? Hunter Bell – We had tackled themes of friendship, creativity and art in [title of show], and wanted to consciously explore new ideas. It was interesting in that it led to some larger philosophical and cosmic questions, and a lot of self-examination. To me, the show explores the question, what is happiness? What does that even mean? What is the quest for that? And trying to be more present in your life than stuck in the past or wanting something from the future. But it’s always coming through this fuzzy pumper of musical theatre influences, “The Muppet Show”, Donny and Marie, these brains of ours. We don’t claim to be scientists or philosophers, but hopefully what will be entertaining is taking some of those larger questions, and putting them into a musical. Susan Blackwell – I would describe the form of the show as ‘quilted’. We take stories and songs that delight us or move us, philosophy and concepts that challenge us, metaphors that we feel are apt, and look for interesting and surprising ways they bump into and play off each other. It feels like a good ol’ fashioned quiltin’ bee. The show explores birds, bees, reptiles, early man, ancient civilizations, and outer space. Also, loneliness, friendship, hoarding, hiding, laughing, living, and dying. And middle school. And dinosaurs. What was the first seed of NOW. HERE. THIS.? SB – While we were doing [title of show], I was having a casual chat with Vineyard alums Robyn Goldwasser and John Flansberg (PEOPLE ARE WRONG!) and they said, the key is to start your next thing now, so you have the traction of one project to move into the next. I thought that was so smart and it put a bee in my bonnet: I wanted to work with this group again, and I wanted to start something then to make sure that something got started. HB – The feel of the show came out of a piece we did as a benefit for Broadway Cares, about our first experiences seeing Broadway shows (“My First Time”). It was autobiographical storytelling woven with original music, and played with ideas Susan had in her mind about how stories can be told. SB – I was interested in capitalizing on the voices and the stories of multiple tellers as opposed to a single storyteller, like a brilliant Spalding Gray…to collage multiple perspectives together and see what happened. In the early stages, the show utilized pre-existing music rather than an original score. Why and At what point in the process did the desire for an original score emerge? Jeff Bowen – Early on the plan was to use familiar songs or pop songs, but sometimes that can be like trying to squeeze a square peg into a round hole. You see it with every jukebox musical — at some point there’s a burst of weird lyrics that have nothing to do with the story. There comes a time when you can be much more efficient when you have an original score and lyrics. As the book was starting to say bigger things, we knew original music and lyrics would augment that. What excites you about the music for the show? JB – The music has been so fun to do. [title of show] was written for one keyboard, so it’s exciting to have a band. It’s like all of a sudden I’m using oil paint instead of acrylic. You’ll hear all kinds of music in the show, from bluegrass to pop-rock to rap — it’s all over the place because our lives and adventures have been all over the place. The storytelling time travels, and I get to do the same thing with the music. Many of our members were able to see the developmental lab production last spring. What was that experience like for you? SB – It was a whirlwind because we were writing during the day and performing at night. The lab became a real-time classroom in front of — god bless ‘em — a paying audience. HB – To be able to have this direct pipeline to an audience in the dark — as opposed to an afternoon reading for a few people in a rehearsal studio with the lights on — it really forced us to go out there and fail gloriously and succeed gloriously in real time. I found that terrifying, liberating, and so informative. I’m crazy grateful for it because it was a protected learning environment. I think in entertainment culture you want to see the finished product, and that’s what you should see. But things don’t just appear; somebody’s got to get Cinderella ready for the ball. It takes labs, workshops, writing retreats, notes sessions at midnight, to make really, really good stuff happen. It takes an enormous amount of work and some risk to put in front of people, to succeed and fail. I think it speaks volumes too about the Vineyard subscribers, who want to be part of that development. As terrified as I was through the Q&As, or people coming to watch wherever this was in the process, I was blown away by that support. How has NOW. HERE. THIS. changed since the lab? What can people who came to see the lab expect? HB – Audiences can expect to see a lot of new material — there are a lot of changes and new things to look forward to. I think over the past few months the seeds have really evolved into a show. The six of you have such a unique and special collaboration with one another. Can you talk about what makes your collaboration such a good one? JB – I think for us the collaboration has held up really well because we work, talk, hammer it out; we go to some deep places, and at the end of the day we all go get some ice cream and go watch a movie or something. It’s like family, and we all happen to have these special skills that come in to play when we put on a show. We exploit the hell out of each other’s talents. SB – I second that, and would say that we all have our eyes on a long-term commitment to each other. I think you treat each other differently when you’re like, I’m married to you for the long haul, rather than, I’ll do a three-month play with you. There’s a different level of investment. HB – Yes to all of the above, and I’ll add that I have a great respect for the people in this collaboration as human beings, who inspire me to want to be a better person and a better artist, but also for their talent and ability. When we read something new, whatever magic powers any one of the six possesses, I look forward to what they have to say, it lights me up. For me, it’s also about checking my ego and trusting that when I let people in and really listen, it just gets better and better, all boats rise. [title of show] is now being done all over the country and will open on the West End next season. How does that make you feel? HB – The writer part of me is so happy that that story is still getting told, and not just that audience experiences have been good; Jeff and I always say that if those casts had a thimble of the joy and fatigue and jubilation and the roller-coaster ride of excitement that we experienced, then that meant everything. We’ve seen that in corresponding with them and going to see the productions and in the YouTube videos they create; a lot of what we’ve gotten back mirrors our experience, of loving working on the show and forging the friendships. That’s been exciting. We just created a high school version of the show — now with fewer f-bombs! SB – In alignment with the themes of NOW. HERE, THIS. I am resolving to embrace all aspects of my life: the awesome parts and the nawsome parts. JB – Using the show as a guide, really just being present… making sure I’m listening and paying attention to what’s going on in the world. SB – In the now here this, Jeff? JB – In the now here this-ness of it all. Or, I could say I’m going to quit smoking, and then feel good about it because I’m not a smoker. HB – That’s the laziest resolution I’ve ever heard in my entire life.